What is the difference between `IO` and `Data` in the Activity Monitor? The two graphs look somewhat similar. I understand that I/O very likely stands for Input / Output. What is the difference between IO and DATA? Not the answer you're looking for? 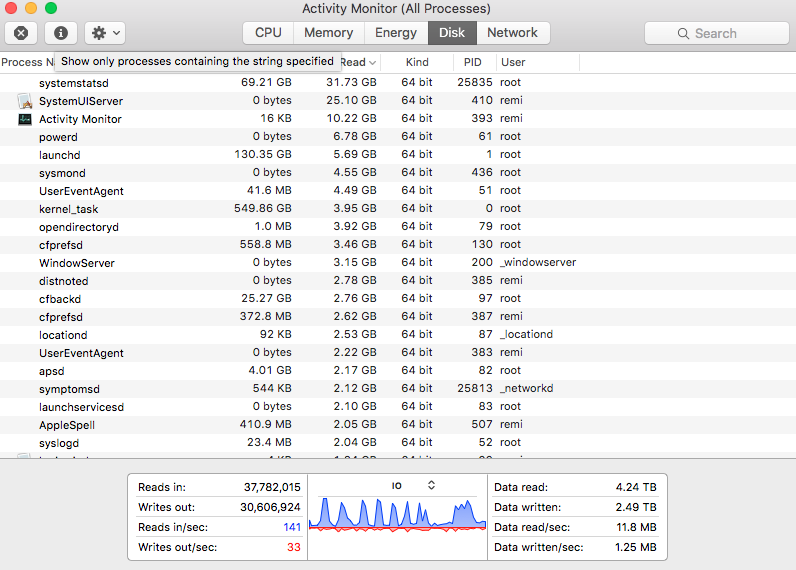 Browse other questions tagged hard-drive activity-monitor bus-power . What are the alternatives to Activity Monitor that will summarize cpu time over time? What kind of “messages” does Activity Monitor track with the “Messages Sent” and “Messages Received” columns? Why is search in Activity Monitor disabled? In activity monitor what time frame is the data sent / received data from? How Often Does Total 'Data Received' Reset in Activity Monitor? Activity Monitor lagging and requires force quit? Keyboard shortcut to switch between Activity Monitor tabs? What is mediaremoteagent under Activity Monitor?